The Seven Days website, billed as “Vermont’s Independent Voice”, has published an interesting article titled “From Railroad to Statehouse: A Chef Comes Home.” It is about Shaun Murphy of Plainfield VT, who is now working as a cook in the Vermont statehouse. Long time AAPRCO members will remember Shaun as the Chef & Steward of the late Dean & Mary Helen McCormick’s private car SCOTTISH THISTLE. 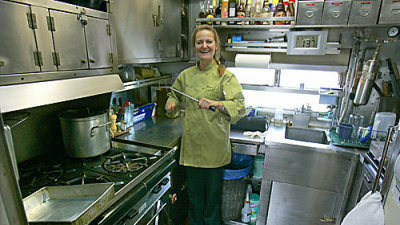 Chef Shaun Murphy working in the kitchen of SCOTTISH THISTLE, circa 2009.